See new Variegated Platinum Blonde Lavender! This Spanish Lavender has beautiful dark purple flower corollas with white bracts on top that turn to the palest ballerina pink with age. This stoechas Lavender is very eye catching and fragrant. You will want to grow this Lavender in your flower garden. Lavandula stoechas Ballerina is hardy for Zones 8- 10 and grows from 1 1/2 tall - 2 feet in width. 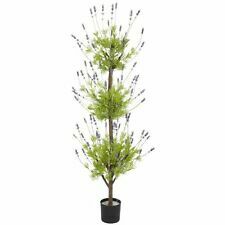 Plant Ballerina where it will get the attention it deserves such as next to a patio or entrance walkway where the unusual color of the Lavender flowers. can be fully appreciated. May be grown in a container in colder regions and moved to a well lit sheltered garden shed during the colder months.